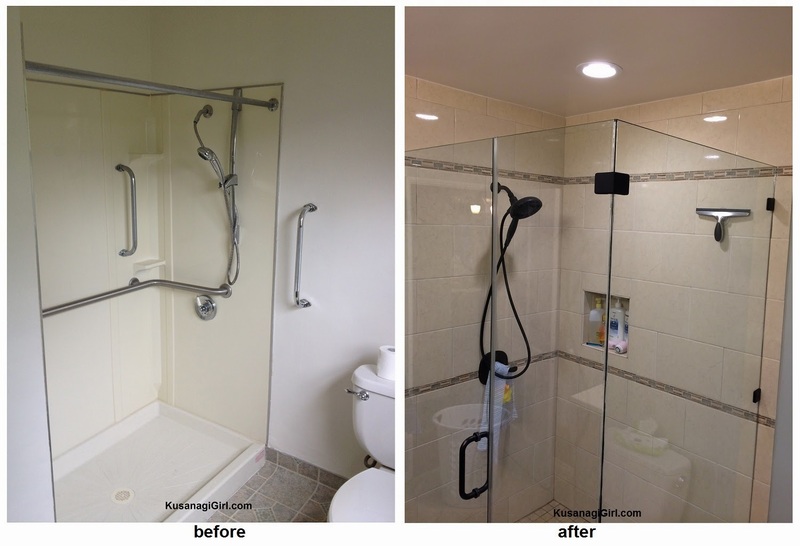 KusanagiGirl: Home Improvement Project: Upgrading our Bathroom! 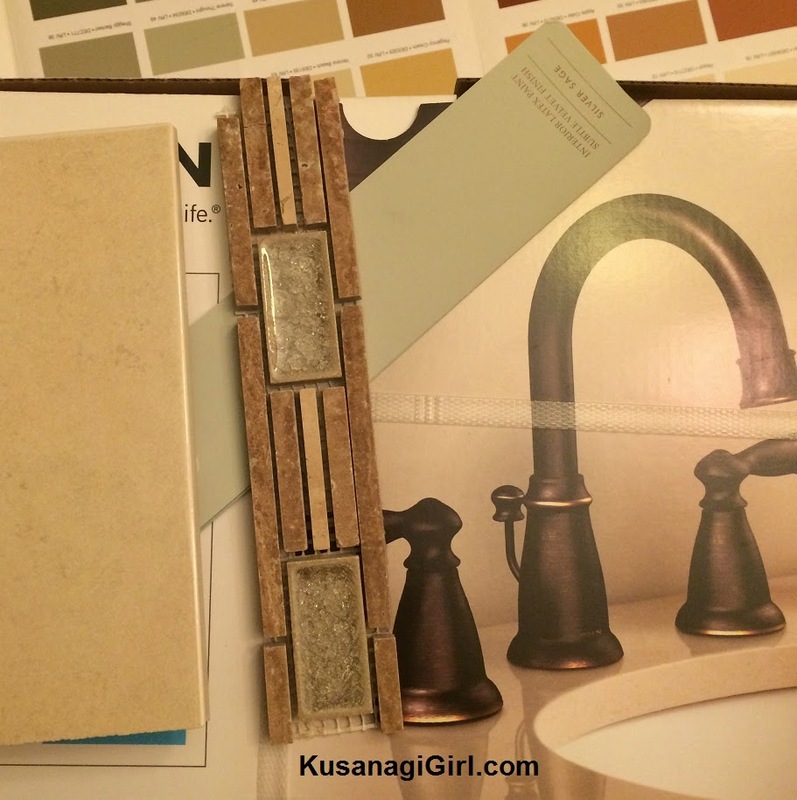 Home Improvement Project: Upgrading our Bathroom! Sure, my husband and I could have bought and moved into a house that had already been brought into the 21st century, but where's the fun in that? On the one hand, our house has a lot of character having been built before the Great Depression. On the other hand, there are some things that really need updating. With our savings, we decided to tackle the bathroom first. 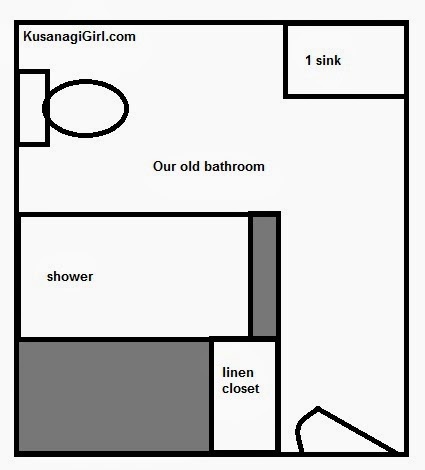 Here's the floor plan for the old bathroom. There was a wall in the middle of the room. The wall in the middle of the bathroom ate up a lot of space in the bathroom and wasted precious square footage. Additionally, there was a very small sink in such a large bathroom. For a one-bath house, this made mornings a "my turn, your turn" routine. The construction phase of the renovation lasted 3 weeks. But look at how open our new bathroom is now! I feel like these pictures adequately portray the vast improvements in the "after". My husband likes to tell people I designed the bathroom but that's not true. My husband advocated for the faucet fixtures to be separated like you see in the picture above to draw attention to our granite vanity top. He also selected our wall color (Silver Sage, for those who are curious), and had the original idea for subway tiles in the shower. We waffled back and forth on the wall tiles in the shower and ended up getting a subway tile styled wall with large 9" x 13" glossy tiles. And for the tiling details, we agreed on this rectangular one because it looked American Indian. We might have changed our minds several times on the tiles for the floor and wall, but the one thing we were adamant about was that this bathroom was going to stand the test of time. We didn't want something that would look dated 30 years down the line and we wanted it to blend in with the theme of the house. We are planning to rehire this contractor for future work to the house. 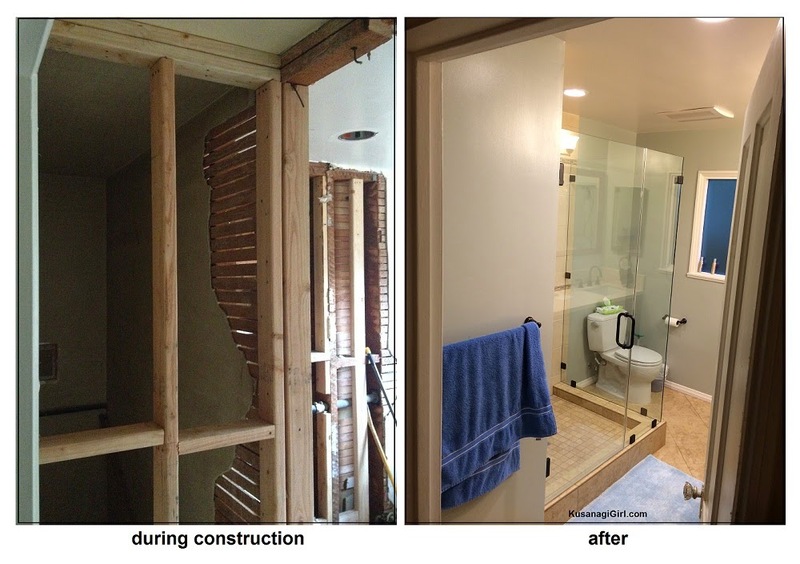 If any of you are in the Los Angeles, Orange County or San Bernardino area and are looking for a contractor for your home renovations, let me recommend ours. He's really committed to quality and is so easy to work with. He will work with you on design ideas so that your house is truly your house. Innovative Builders & Design located in Long Beach, CA. Oh wow! You guys did an amazing job! Love, love, love the before & after pictures! Thanks, Linh! The bathroom is now my most favorite place in the house! LOL! The bathroom looks amazing! I love the color scheme and the openness.. simply amazing. Thanks, Ari! The wall in the middle of the bathroom just had to go to make the space more efficient. I wished we could have done as you and did some of the demo-ing ourselves!